Dr. MacDonald is presently employed as Vice President, Academic & Applied Research at Holland College, Prince Edward Island. 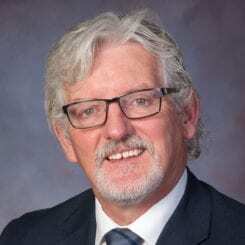 He was most recently Deputy Minister of both Workforce and Advanced Learning, and Education & Early Childhood Development Departments for the Government of Prince Edward Island. Prior to Government, he was Superintendent of the largest School Board in the Province. He is a past member of the Governing Board, Centre for Educational Research and Innovation (CERI), at the organization for Economic Cooperation of Development (OECD) in Paris, France.